Crochet Hook Size Chart: Which Hook Should I Use? 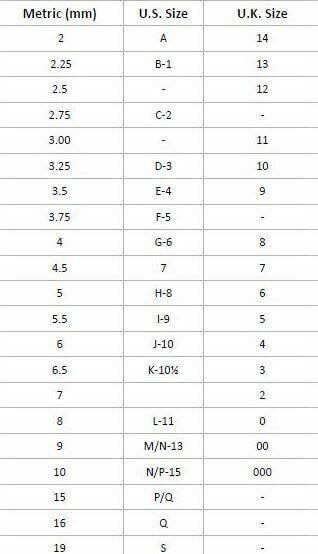 Since crochet hook sizing can differ across brands and locations, it’s helpful to have a crochet hook size chart to reference to make sure you are using the correct size hook. Crochet hooks come in a variety of sizes in order to work well with a particular yarn weight or to achieve a desired fabric effect, such as density or drape. For example, a quick reference of a yarn weights chart will show the recommended hook or needle size for each yarn weight. Of course this is just a recommended size to reach the noted yarn gauge, but you may choose a different hook size to adjust for your individual stitch tension as well as the effect you are trying to achieve. U.S. crochet hooks are traditionally marked with a letter and/or number system, such as B-1, while U.K. and Canadian hooks follow a numeric system, such as 13. Some brands may also include the metric markings on the hooks. Because of these labeling differences across brands and locations, it is best to rely on the metric sizes for accuracy. The chart below correlates the metric crochet hook size to its U.S. and U.K. equivalents. Adapted from the Craft Yarn Council. What Crochet Hooks Size should I use? To choose the best hook size for your project, check the label of your yarn or reference a yarn weight chart for the recommended hook size. If you are following a pattern, use the hook size noted in the pattern as a starting point. If sizing is important, such as for hats and other garments, work up a gauge swatch to ensure you match the gauge indicated in the pattern. (What is gauge and how do I check for it?) If not, you can adjust your hook size smaller or larger to achieve gauge. If sizing is not important, you can use the size that feels best to you and gives you the fabric result you desire. Keep in mind though that the finished size of your project and the yarn amounts used may differ from your pattern. Steel crochet hook sizes are not included in the chart above. Steel hooks are generally used with lace weight yarns or crochet threads and are sized differently than regular hooks. The higher the number of the steel hook, the smaller the hook is. Steel hooks range in size from a #14 or 0.9 mm (the smallest) to a 00 or 2.7 mm (the largest).